Analyze and compare growth trends over time by monthly or quarterly cohorts. Which cohorts have the highest engagement? Which cohorts engage the most on social? What’s our MRR growth by weekly cohorts? Which cohort reads our docs the most? Which cohorts install the most integrations? Identify revenue patterns throughout the customer lifecycle to retain your best customer types. 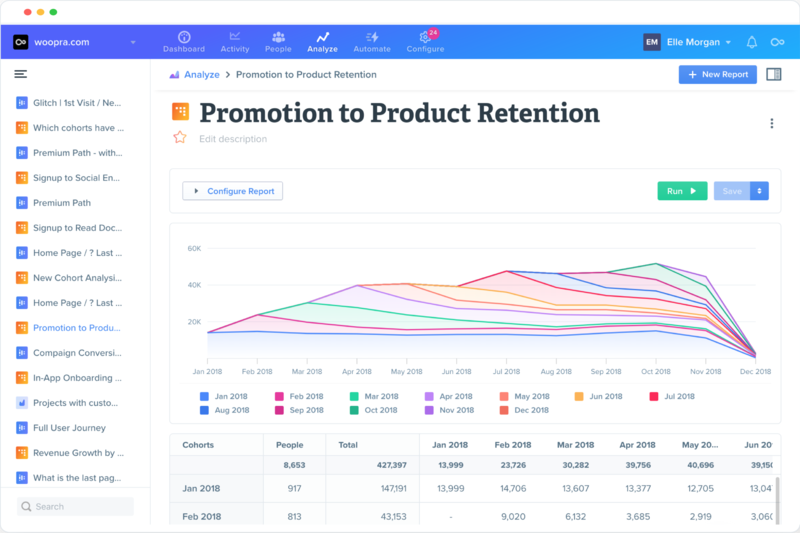 Use Cohort Analytics Reports to calculate month over month revenue and identify the factors driving retention, stickiness and customer health. 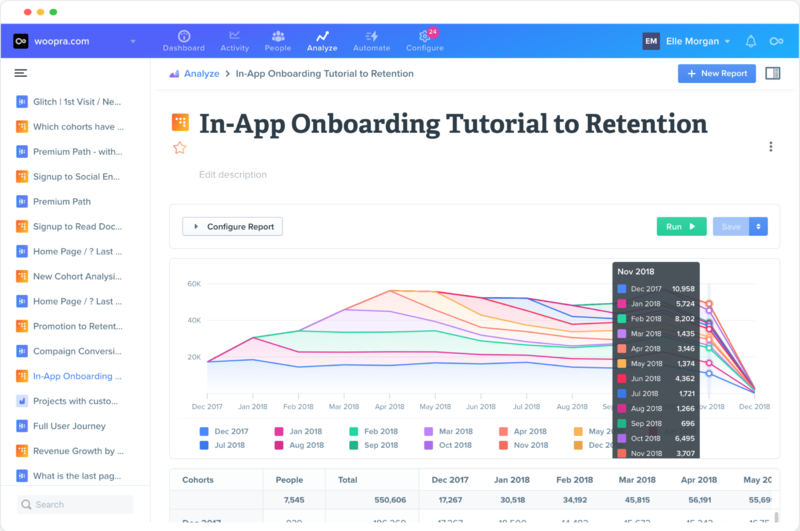 With Woopra’s Cohort Analytics Reports, you’re not limited to analyzing cohorts by simple acquisition or signup dates. Understand the impact new in-app experiences have on product usage and how that engagement impacts retention over time to build features that drive long-term success. Acquiring new customers is great, but retaining them is greater. 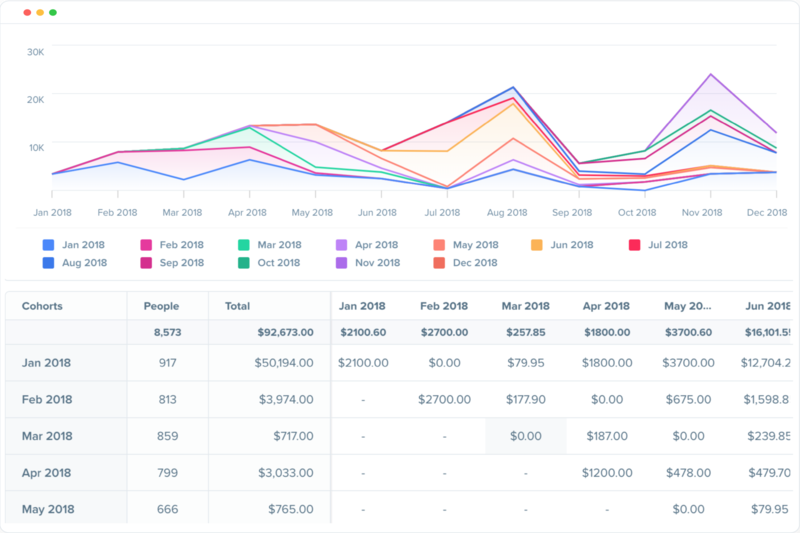 Woopra’s Cohort Analytics Reports allow you to analyze beyond the point of conversion, helping you understand which campaigns or promotions deliver your most engaged customer types month over month.